You may have missed it among all the news coverage of the upcoming midterm election, the tweets, and the World Series. The UN’s Intergovernmental Panel on Climate Change released a report outlining the catastrophe which is approaching if we don’t do anything to head of the warming of the Earth – fires, flood, drought, severe weather, which will invariably lead to climate refugees, fresh water shortages, and conflict over arable land and water. Only one nation isn’t on board with the rest of the world. The United States. The report “is quite a shock, and quite concerning,” said Bill Hare, an author of previous I.P.C.C. reports and a physicist with Climate Analytics, a nonprofit organization. “We were not aware of this just a few years ago.” The report was the first to be commissioned by world leaders under the Paris agreement, the 2015 pact by nations to fight global warming. The authors found that if greenhouse gas emissions continue at the current rate, the atmosphere will warm up by as much as 2.7 degrees Fahrenheit (1.5 degrees Celsius) above preindustrial levels by 2040, inundating coastlines and intensifying droughts and poverty. …and a link to the actual report. The report highlights a number of climate change impacts that could be avoided by limiting global warming to 1.5°C compared to 2°C or more. For instance, by 2100, global sea level rise would be 10 cm lower with global warming of 1.5°C compared with 2°C. The likelihood of an Arctic Ocean free of sea ice in summer would be once per century with global warming of 1.5°C, compared with at least once per decade with 2°C. Coral reefs would decline by 70-90 percent with global warming of 1.5°C, whereas virtually all (> 99 percent) would be lost with 2°C. We accept the science which makes our cell phones and computers. We accept the science which brings us our television programs and podcasts. We accept the science of medicine whenever we go to the doctor or take a prescription. We accept the science of flying on airplanes. Climate change caused by human action is as established a science as any of those things. The only “doubters” are those whose millions billions are made by, or supported by fossil fuel companies. These are the same people who brought you the “Cigarettes are not harmful” lie. WILL YOU BE HERE IN 20 YEARS? Will we come to our senses soon enough to preserve our environment for our children and our grandchildren (and our great-grandchildren)? According to the UN Report, we should change our ways for anyone who expects to be alive in twenty years, too. At “three-score and ten” I may not be around in 2040, but (hopefully) my children, my grandchildren, and my great-grandson will be. 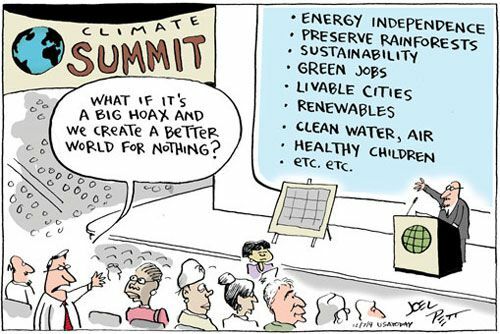 Are we smart enough to sacrifice some economic gains for clean air, clean water, and a livable planet? The Earth will be here in 20 years no matter what we do. Will we?